Our main focus is to provide the best service possible for our customers. See what our customers are saying about us! "Thank u so much Tammy! Your assistance is greatly appreciated! I look forward to hearing from you next month." "The phenomenal service you provide me is definitely worth referring to others. Thank you for everything. :)"
"OMG that’s fantastic that you got me a reduction on my Full Premium for the truck. See, that what I was saying about dealing with you and Armour...an amazing experience. Thank you thank you thank you!" "I just wanted to take a minute to thank you for your excellent customer service we received. Katie is always knowledgeable and polite. She is very deserving of job well done and speaking with her reminds me that Armour was a great choice to have as our insurance broker." "My broker has answered all my calls and also goes above and beyond by following up via an email. He listens well, a great person to have on your team. He is the perfect example of what I expect from a broker. I am returning client to Armour simple because the service was always great." "I always recommend Armour Insurance. I have always been very pleased with the help I have received especially in the last year." "My broker was prompt, professional and courteous. I was very pleased with her efficiency and customer service." "I have to give a huge shout out to my broker! She literally does not stop working until her customers get everything they need! She goes above and beyond and I am so thankful she was referred to me! You rock girl!!" "My broker is a really good guy, helped me out with everything I needed, gave me the best options, informed me as much as he could as a new driver and registrant. Very personable and I generally enjoyed talking to the man. Thank you again." "Thank you again for all of your assistance. It is greatly appreciated. It was quite refreshing to work with someone who was so diligent and willing to assist me." "They gave me the cheapest quote! Nice people to deal with!" "The academy award goes to the staff of armour insurance! When things go wrong, it's nice to know your insurance company has your back! I have been with you over 25 years! You called me first when we evacuated Fort Mac while still driving after 14 hours! You had answers and I was handled so well! I recommend you daily while I cut hair in my very busy salon in Fort Mac! Our adjuster was amazing too! Met us with a smile the first day we re-entered and still texts us." "My Dad has been using Armour insurance for many years and he swears by it. We called and got some insurance quotes and the customer service was spectacular. Which is why when our insurance is up, we will be switching to Armour!" "We have been a client for over 20 years because of the great service we receive from the north end Edmonton office. The staff there are the greatest. Again a big thank you." About a broker at Armour "She assisted me in securing my policy along the way and provided me with her expertise accumulated throughout the years. With excellent communication skills, customer service, deep and thorough understanding of her specialty area, she is patient, open-minded, and very professional, which undoubtedly would make her a great choice whenever it comes to insurance business." "Thank you so much for your help. Above and beyond service. We so much appreciated all the help, knowledge, and determination turning an unfortunate and stressful situation into a positive outcome!" "Absolutely fantastic. Extremely helpful. Went out of their way to help with a stressful situation". "I can’t tell you enough how happy I am with their service. 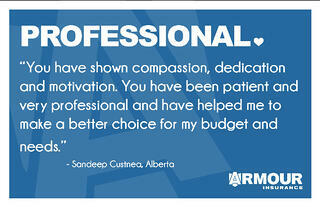 Any agent I’ve dealt with at Armour Insurance has ALWAYS provided excellent customer service. I am so thankful for your excellent service every time I need help. I feel we are in good hands." "Best price on group car insurance that I've found! Agents are always friendly, helpful and if unavailable at the time I call, always return my calls quickly!" "Well they were the only people we could find on a Saturday who insure commercial trucks. But we are glad we found them because they are pretty damn good!" "Jennifer Kent is our new agent, we came over from another company and we were treated so well! Saved us money with new policy! So wonderful"
"Best insurance company ever !!!!!!! Always willing to go that extra mile. Prompt Service every time. I would and do recommend them to everyone". "Very friendly staff and very low prices that can't be beat"
Tell us your Armour experience! We will just your story, first name and city. 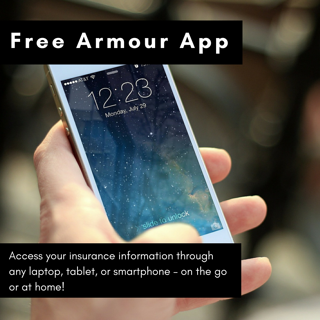 Send us an email at alannah@armourinsurance.ca and let us know what you think. Complete your quote online, over the phone or in person and we'll give you a $10 Tim Horton's gift card. Clickhere for full rules.